The Dallas Cowboys Wide Receiver made a bunch of people really happy last night. Retailers all over the country held midnight launches last night so fans could pick up their new console. 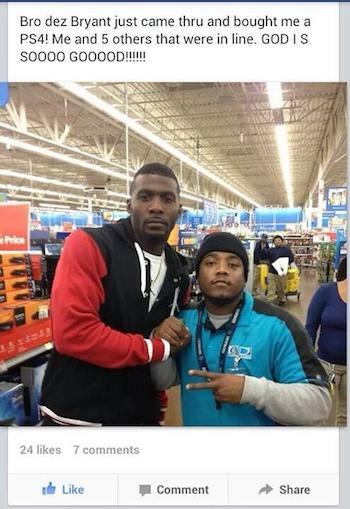 At one of those stores, a Wal-Mart in Dallas, TX, Dallas Cowboys receiver Dez Bryant was among customers waiting to make the jump to a next-gen console. Flashy NFL star that he is, Bryant wasn't content simply buying one PS4 last night, so he bought five: One for himself, and four for the first few people waiting in line. Whether its something as extreme as shoppers trampling each other on Black Friday or excited customers merely getting the short straw when their local store runs out of stock: Large retail events have a tendency to spawn tragic tales. It's nice to see that sometimes these high-intensity situations can end sometime end up with smiles rather than with tears.